When I was a kid, driving with my folks down the road, I used to watch the folks in the other lane going in the direction I had been. I used to think how interesting it was that we had 1000s of cars in our lane going our direction and equal 1000s in the other lane heading the opposite way. I used to think how cool it would be if we could just transfer our desires. We would simply transfer our desire to be there to the others and transfer their desires to be where I had been to me. (I know, weird thought for a kid to have). But alas, some of that has become reality. 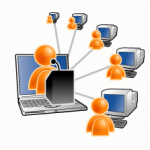 Today you can simply turn on your computer screen and have another join you, via the internet, and conduct a fully interactive meeting with that person; each remaining on his own computer. Face it, today, many of us make our living largely in front of the computer screen. I, for instance, spend large amounts of time creating designs, and structural solutions, research, structural computing, drafting, communicating, etc, etc., etc. in front of the computer. Of course, I do my field actions too traveling to see project, structures, etc.. But the computer is the center of much of what I do. Many of us are that way. And those that are not may still do much in front of the computer during their after hours. What an opportunity, then, for folks to meet. I bet that nearly 90% of the purposes of our meetings could be done in this fashion. Show views and spin views so the client can see the results and can suggest changes in real time. Show examples of what I am attempting to explain to someone. Let another show me various pictures and sketches and explain them in real time. Put a photograph on the screen and point to areas requiring attention. Essentially anything that we might deal with at a meeting, we do in front of our computers. We establish a meeting room with the url address. It is unique. My client recieves an email from me working out a time and the link. At that time my client clicks on the link and we are now in a meeting. Our screens can be shared in either direction. Can establish voice link either via that screen or by separate phone. It's fast, free, saves money and time. My boyhood fantasy, though not well thought out at the time, is now reality (well for the most part). We can travel in desire and action, yet not have to physically leave our homes. And if we choose a face to face meeting, that is great too. But it is sure nice to have the alternatives.